Planning ahead for your child is never easy, more so when you are not around. It is even more difficult if your child is a special child or disabled or suffering from a major illness. How can you ensure that your child will be taken care of when you are not around? Who will take care of your child should you become critically ill or permanently disabled? Would your special child be able to fend for himself when you are no longer around? If your child needs constant medical attention or is suffering from a major illness, would your appointed Guardian have the time and resources to provide such attention taking into account that he/she is working or has a family of his/her own? Does your child need nursing care in the comfort of his/her home? How do you ensure there is continuous nursing care for your child upon your demise? How do you ensure your special child gets the proper medication, education and upbringing? What is the cost to take care of a special child? Is the Guardian able to provide full attention to a special child? What are the financial resources of the Guardian like? Can the Guardian afford to pay for the school fees for the special child? Who will make sure the funds that you have allocated for your child is well managed? Whom can you entrust to ensure the assets you have set aside for is not abused by unscrupulous third parties? Be empowered with UCare Junior, a special service by Rockwills Trustee Berhad where you can plan ahead for your special child for health, maintenance and education. By spelling out your requirements in the trust deed, you will have the assurance that your instructions will be carried out. Just identify what assets you wish to include in the Trust, be it insurance policies, cash or properties. Decide how the benefits of the Trust are going to be given to your child and this will cover terms such as period of the Trust, how the assets are to be managed, how the income from the Trust is to be utilized, method of payment, commencement of payment. A Trust Deed is then signed between you as the donor and Rockwills Trustee Berhad as trustee and the designated assets are transferred to the Trust. Upon the happening of an event, for example your demise, the Trust Fund will be utilized for the child according to your instructions. During your lifetime, you can be one of the beneficiaries thus receiving income from the trust. 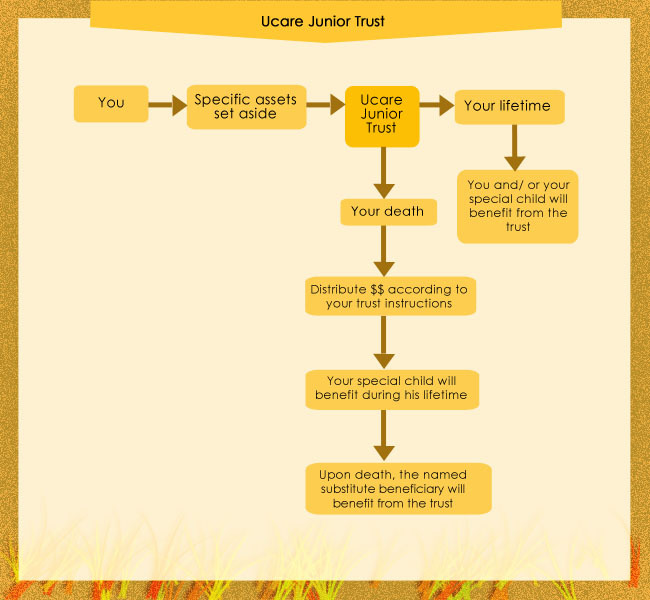 So, in any emergencies, you will be able to withdraw your portion in UCare Junior. It prevents delay and provides for fast distribution to be used for your special child in his/her time of need or it can be accumulated for a specified period. Your beneficiaries will also benefit from our independent position as we shall act impartially and fairly to all beneficiaries. This safeguards their individual interests in the trust. With the appointment of a Protector as a watchdog and advisor to the trustee, there is clear protection of your beneficiaries’ interest. By appointing Rockwills Trustee as your substitute trustee, you ensure that your instructions in the trust are carried out by a professional and experienced trustee.